Pork covered in a smoked paprika, bell pepper, courgette & tomato sauce, served with bulgur wheat. Lime: Using the fine side of a box grater, grate the peel to create zest. Then cut into wedges. Rice: Place a pot on medium-heat and add the rice. Pour in the boiling water (½ cup for 1) with a pinch of salt and boil gently for 15 minutes until cooked, but with a slight bite. Drain. Coconut flakes: Toast in a dry pan for 1-2 minutes on a high heat until lightly browned. Remove and set aside. Curry: Place a pan on high heat with a drizzle of olive oil. When hot, add the pork mince and cook for 4-5 minutes, breaking it up with a spoon. Season with salt, then add the onion and sauté for 2 minutes. Turn the heat down to medium, add the ginger, chilli (optional), garlic, turmeric and cauliflower and cook for 3-4 minutes. Pour in the coconut milk and water (2 tbsp for 1) and let it simmer (gently boil) for 4-5 minutes until the sauce has thickened. Add the Swiss chard and let it wilt for 1 minute. Season with salt and pepper, add the lime zest and a squeeze of lime juice. 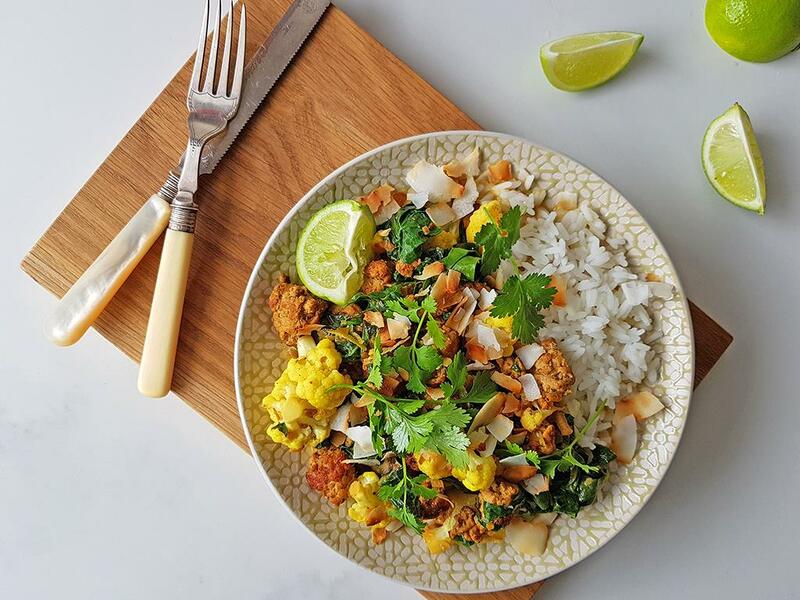 Serve the rice topped with the pork curry, toasted coconut flakes and fresh coriander leaves.